The profit of the French tire-maker Michelin increased considerably in the first half, with strong tire sales bolstered by a cost-cutting plan. Michelin said net earnings over the period rose 58 percent to Ђ436.7 million (US$599.24 million) from EUR 276 million. The operating margin rose 2.2 percentage points to 10.2 percent. 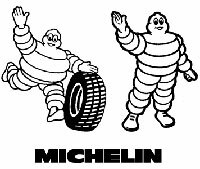 Michelin said it expects operating margin in the second half of the year to approach the first-half level. Both results beat analyst expectations. A poll by Dow Jones Newswires had tapped the operating margin at 10.1 percent and net profit at EUR 421 million (US$577.7 million). Previously, Michelin had promised only a "tangible improvement" in operating margin from the 8.2 percent level achieved in 2006 - much lower than the 10.2 percent announced Friday. "For the full year 2007, in light of healthy demand, despite higher average raw material costs in the second half than in the first, Michelin confirms that fiscal 2007 should post a substantial improvement relative to financial year 2006," the company said. Growing demand in its main markets, especially for truck tires in Europe, South America and Asia, led profits. Michelin said it was able to pass on the rising cost of raw material prices to its customers. Margins were helped by continued cost-cutting efforts in line with Michelin's stated plans to cut EUR 1.5 billion to 1.7 billion (US$2.06 billion to $2.33 billion) by 2010.